With this online tool, academics can collaboratively write and/or edit documents in Rich Text or LaTeX anywhere, anytime. The service allows them to share and invite colleagues to co-author, check, edit, or comment on a file without having to pass a manuscript around or deal with several versions of a document. It also minimizes errors and helps prevent long email discussions. A basic version of Overleaf, which offers a storage space of up to 1GB and allows up to 60 files per project, can be used for free. However, if users require more storage or additional features, they can purchase the Pro or Pro + Teach versions. The service offers several benefits to authors, institutions, and publishers. Thanks to its many interesting features, many institutions offer the Pro version to their members for free. Moreover, some publishers have partnered with Overleaf to simplify the submission process. 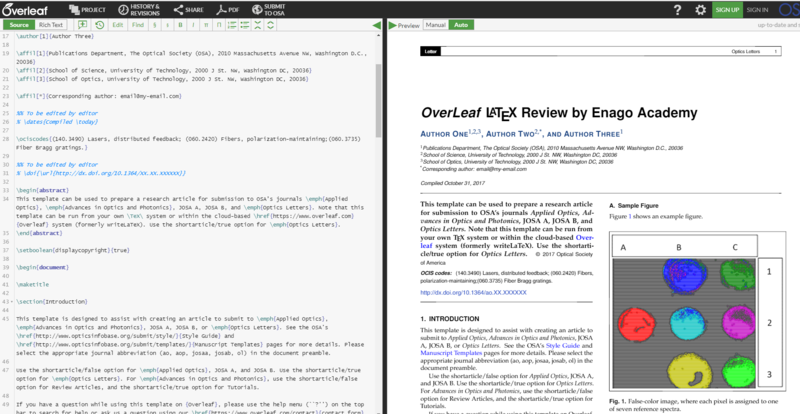 For a number of journals, authors can use the readily available Overleaf LaTeX templates and submit directly from Overleaf to the journal’s editorial office. You can start working and collaborating online right away without having to install a software program. You can see and edit your projects—or check the changes made by your colleagues—in real time from remote locations. You can send a sharable secret link (assigned to every project) to your colleagues to start a collaboration. Only authorized users can have access to the corresponding file. You always access the latest version. All the changes made by you or your co-authors are synchronized. You can communicate with your co-authors by adding comments and/or notes to the files. You can edit in Rich Text or LaTeX and easily switch between the two modes. You can quickly rectify any error based on the alerts received. You can use various templates and features to create tables, prepare great presentations, draft journal manuscripts, compile theses, or create bibliographies. You can create protected projects for enhanced privacy with the Pro version. You can also add and remove collaborators at any time. You can use journal-provided manuscript templates and make direct submissions to journals from several publishers or to repositories instantly through an integrated feature. You can incorporate reference managers such as Mendeley or Zotero when drafting your manuscripts. Do you think that Overleaf could help you communicate your research better? Are you interested in learning more about this service? In the next part of this series, we will provide a user guide with information on how to sign up and work with different templates. You can also find more information in this short introductory video. If you are already an Overleaf user, we would love to hear about your experience with this exciting tool. Does it make your work with colleagues more effective? Is it easy to use? Which features do you like most? Please feel free to share your thoughts with us by commenting in the section below.